Roma in Macedonia: A Decade of Inclusion? 73% of the Roma children who enroll in school never finish it. This is what statistics from Macedonia says. Back in 1993 there were only 3 Roma students in Macedonian universities. Today, thanks to the quota aimed to encourage higher education of minority communities and the several private universities, this number is around 150. Many of them won't graduate. In addition, the numbers do not always give all sides of the story. Statistics is often blind; this one in particular operates with the number of university students declared as Roma. It doesn't tell however that sometimes students from the majority declare as Roma to take unfair advantage of the quota system for minorities. "We feel discriminated over the abuse of the quota system and the false declaration of non-Roma students as Roma", says student Redzep Ali Cupi. He suggests that at enrollment, ethnic affiliation should be determined based on data from the high school records rather than - a personal statement.
" I did four grades. Then I didn't have where to get the books from" says Rafiz, a street child from the centre of Skopje. His brother Sali who works with him never even started it. Their job is begging. Together they make up 5 euro a day. "The biggest problem is the delayed enrollment of Roma children and the fact that many parents do not enroll their children in primary education at all. Then, it's the very high dropout rate", says Dragan Nedeljkovic from the government body for education of minorities. "It can happen that up to 3-4 children from a family are of school age. The books and the school kits are expensive. It is impossible for the parents to sustain this economic burden", says Saip Iseni, principal of a primary school in the largest Roma community in Macedonia, Suto Orizari. There are numerous projects and organizations that work on the issue of education of Roma children. Still, breaking vicious cycles is difficult. Each Roma high school student gets a scholarship of 60 USD per month and a mentor. Resources secured by USAID with the purpose of fighting dropout. There are 54.000 Roma in Macedonia. (This is another questionable piece of statistics as the identity declaration of Roma can be quite ambiguous). Of them, 17.000 are unemployed and 14.000 cannot afford the basic necessities. 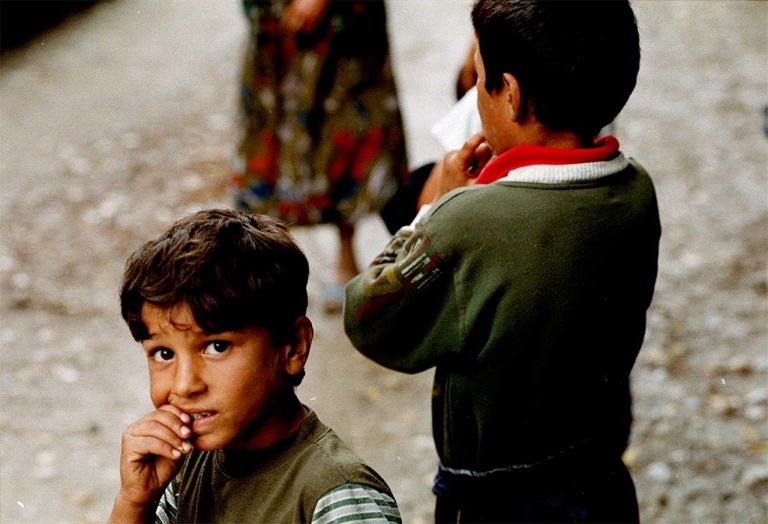 Another statistics says that 85% of the Roma in Macedonia receive social welfare. The family of Raim Haim numbers 10 persons, who live in 10 square meters in the poorest Roma neighborhood in Skopje - Topana. He supports all of them by playing the harmonica. Nobody else has any income. He can make from 3-5 euro on a good day. None of them get welfare. "We do not know where to ask for welfare. It takes many documents. We do not have the documents and don't know where to ask. It is misery to be uneducated" says Raim. The most common occupations for Roma are the petty trade, recycling, scavenging garbage containers, begging. Women are traditionally working as house cleaners. The government recently, on the occasion of the International Day of Roma, April 8, promoted the National Strategy for Roma. It does this under its commitment within the Decade for Roma Inclusion - a project enfolding 9 countries in Central and Eastern Europe, launched earlier this year by World Bank, Soros Fund, and the governments of Hungary and Bulgaria. Under this program concerned government have to adopt and over a ten year period, implement national strategies aimed at advancement of Roma in their societies. The Macedonian strategy has four priorities: housing, education, employment, and health protection. "Roma in Macedonia are facing many problems related to poverty, insufficient education, and life in substandard conditions", said prime minister Vlado Buckovski at the launch of the National Strategy. "We will have to jointly contribute to their full integration into society". Still, according to Buckovski, "Macedonia will undoubtedly serve as an example in its region for its successful integration of Roma into society". Buckovski reiterated the foregoing positive developments in the improvement of the status of Roma in Macedonian society (often repeated in every occasion): they are recognized as constitutive peoples in the constitution, Macedonia has, according to many, the only Roma governed municipality and the only Roma mayor in Europe; it has a Roma member of parliament and a deputy minister. There are several private Roma TV channels. There are numerous Roma NGOs some of which regularly cooperate with the government. Yet, according to Ramadan Pilji from one of the largest Roma NGOs "Mesecina", "the government to date hadn't done much for the Roma". "We are not content" says he "but we are optimists and want to believe. We will have to work hard in the next 10 years." There is often criticism addressed also at the Roma NGOs however, for not being accountable to their constituency, being corrupt and ran by a handful of individuals who favor their own private interests over the needs of the population they are supposed to serve; few people who managed to hugely benefit from the belated interest of the international community in the misery of Roma. Recently the World Bank representative in Macedonia, Sandra Blumencamp, commended the country as being a regional leader in the social inclusion of Roma. Members of the EU Parliaments who ran an assessment of the situation of Roma in the country considered Macedonia to have relatively elevated standards. Yet so much runs underneath the surface. There is this rhetorical question whether somebody is discriminated because they are poor, or vice versa, the fact of being discriminated over a long period of time makes you and keeps you poor. Macedonians will say that Roma are not discriminated in Macedonian society. How could they be - they have all the rights? Still, you don't see them going to the same bars as Macedonians. Is equality a matter of theory or fact? Roma surely have a long way to go to get anywhere close to it. Everybody will agree on that.